Global Travel News: Hello Philippines, Mabuhay! The Philippines is made up of 7,107 beautiful islands and its capital is Manila that is located on Luzon Island. The Philippines is mostly a Catholic country but the lower region, Mindanao, is mostly a land for the Muslims. There are lots of tourist attractions around the Philippines and one of their best tourist attractions is none other than the Boracay beach. It’s located in Panay Island in the Visayas and many tourists come here to enjoy the beach, party and bask in the sun while enjoying their super clear water and powdery white sand. 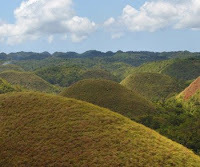 The Chocolate Hills in Bohol are really a must-see. Over 1,700 small hills are spread in a 20 square mile land and are covered with green grass that during the dry season, it turns brown thus it looks likes chocolate. The Mayon Volcano is the perfect coned volcano in Luzon. The Taal Volcano in Tagaytay is also quite popular because it’s a volcano within a volcano or a volcanic island. If that is not easy to understand, just visit it and see for yourself what it means. You will love it. The tropical climate in the Philippines lures lots of tourists especially during winter season. It’s usually warm in the Philippines and tourists just love that.